WASHINGTON, D.C. — U.S. Senator Sherrod Brown (D-Ohio) and U.S. Representative Lloyd Doggett (D-Texas) have announced legislation that would address the prescription drug affordability crisis. Their Medicare Negotiation and Competitive Licensing Act would authorize the Secretary of Health and Human Services (HHS) to negotiate drug prices and, if drug companies refuse to negotiate in good faith, it would enable the Secretary to issue a competitive, compulsory license to another company that is willing and able to produce the medication as a generic. 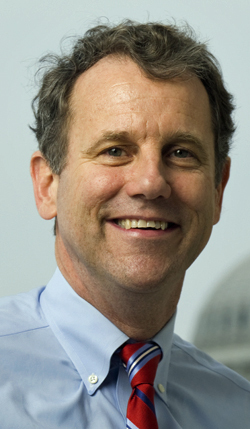 Senator Brown is the lead sponsor of the bill in the Senate; the original co-sponsors of the bill in the Senate are Senators Amy Klobuchar (D-Minnesota) and Tammy Baldwin (D-Wisconsin). Congressman Doggett is the lead sponsor of the bill in the House of Representatives; his original co-sponsors of the bill in the House are Representatives Peter Welch (D-Vermont) and Elijah Cummings (D-Maryland). “The purpose of medicine is to help people, not to line the pockets of Big Pharma executives. Our bill would call Big Pharma’s bluff and demand prescription drug companies offer fair prices, or be boxed out,” said Senator Brown, who also introduced the Stop Price Gouging Acton Thursday. That bill would penalize pharmaceutical companies that engage in price gouging without cause, leading to price spikes for patients who rely on medication to treat diseases ranging from cancer to addiction. “Let’s cut prices so that patients don’t have to cut pills in half. Our proposal responds to an American problem, rampant prescription price gouging, with an American solution — negotiation and competition,” said Representative Doggett. “We repeal and replace the Republican-imposed law prohibiting negotiation and empower the use of generic competition to lower prices. “Medicare is one of the largest drug purchasers in the country. It should not be restricted from negotiating the best deal with drug manufacturers,” said Senator Klobuchar. In 2018, Americans spent an all-time high of $360 billion on prescription drugs. According to a 2016 Consumer Reports survey, 30 percent of Americans who experienced an increase in the price of one or more of their medications left a prescription unfilled because it was too expensive; 15 percent said they cut pills in half to make them last longer.